Les has been busy behind the scenes and his hardwork has paid off there will be robots galore and an interactive version of Pacman to play with, we also have two Raspberry Pi inventors bringing along their cool new projects. is a mad inventor of Raspberry Pi powered cat repellants and timelapse cress growing kits. Simon is best know for his work on the Scratch programming language. Enabling it to work with the Raspberry Pi GPIO (General Purpose Input Output) and helping children around the world to build robots, traffic lights and games using the easy to learn programming language. 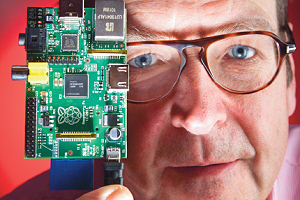 Pete Lomas is the co-founder and trustee of the Raspberry Pi Foundation, the charity created to support the Raspberry Pi computer. Pete is also the hardware designer for the Raspberry Pi and a keen supporter of children learning computing and electronics skills. Pete will be with us all day, and will host a presentation on the genesis of the Raspberry Pi. Pete is also kindly sponsoring pizza for all of our hungry hackers. We will have a number of Raspberry Pi setup ready for anyone to use, so even if you haven't got a Pi you can still come along and have a go. We ran out of tickets, but I have agreed with the venue to increase the number of attendees, so extra tickets have been released. The Jam will be held at the Palatine Library, on St Annes Rd, Blackpool, FY4 2AP. Doors open at 1pm and there is free parking in the car park. We will have power and Wifi, so please bring your laptop, Pi and projects along to show others. All of the facilities have been kindly provided by Blackpool Council who are supporting many different groups, including Blackpool Coder Dojo.